Tulsa starts four-game week with 5-3 win over Utah, thanks to first professional hat-trick from Jiri Fronk. 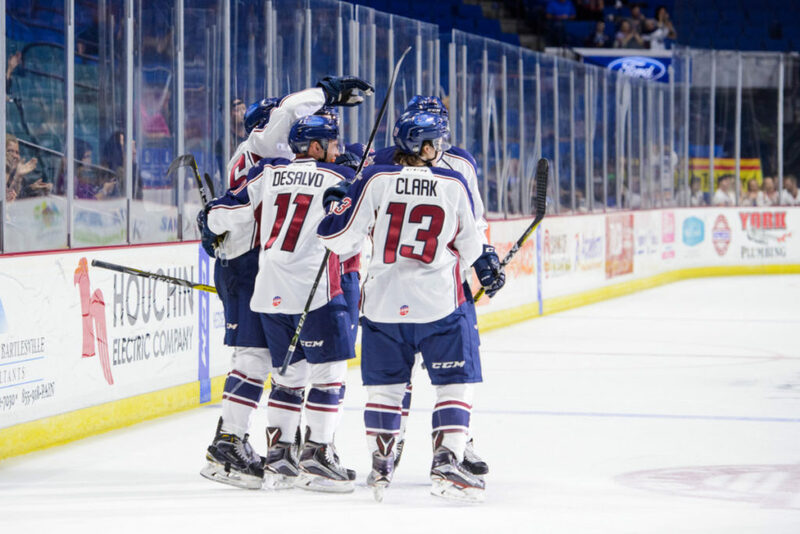 TULSA, OK – After missing the last three games, Tulsa Oilers forward Jiri Fronk scored three goals Wednesday to lead the Oilers to a 5-3 win over the Utah Grizzlies at the BOK Center in the first of a four-game week. A long stretch pass set up the first Tulsa goal, when Dan DeSalvo found Adam Pleskach up ice and led him in on a 2-on-1 rush. Pleskach fed Fronk a perfect pass, which the Czech winger deflected past Grizzlies’ goaltender Ryan Faragher. Utah tied the score off of a face-off win, when a blocked shot bounced to Brandon McNally, who fired the puck into the open net. Former Winnipeg Jets draft pick Austen Brassard gave the Grizzlies their first lead early in the second period on a scramble in front of Oilers goaltender Jamie Phillips. Fronk jammed in a loose puck to even the score at 2-2 when he crashed the net 6:51 into the frame. Tulsa regained the lead 1:13 later when DeSalvo deflected a Chris Joyaux pass into the top corner of the net from high in the slot. The Oilers led 3-2 after two. Fronk tipped in a Nolan Julseth-White shot to complete his first career hat-trick at 8:30 of the third to open the Oilers lead to 4-2. It was Julseth-White’s third assist of the game. But the Grizzlies had an answer again, when Erik Higby snapped a quick shot past Phillips from the right circle to cut the Tulsa lead back to one. The Oilers fought off a late Utah flurry and Phil Brewer added an empty-net goal to seal Tulsa’s fifth win in as many games at the BOK Center. Phillips on the day he was selected ECHL Goaltender of the Month for October, made 34 saves in notching his seventh win in seven career starts. Faragher made 25 saves in his first loss. The Oilers and Grizzlies both have Thursday off, before playing three games in three days. Tulsa starts a home-and-home weekend set with the Missouri Mavericks Friday at 7:05pm at the BOK Center. The Oilers will wear denim-themed jerseys that night, sponsored by Drysdale’s, which will be auctioned off after the game. Utah prepares for two games at Wichita Friday and Saturday nights, before returning to Tulsa for a rematch at 4:05pm Sunday.